At the same time, conflict and poverty in neighbouring countries, as well as Ecuador’s place in the larger global migration phenomenon, have helped make it an increasingly important destination and transit country for migrants and refugees. Between 2001 and 2013, the country’s foreign-born population jumped from roughly 100,000 to 350,000.2 Much of this surge has been linked to the conflict in nearby Colombia, which has forced tens of thousands of refugees across the border. Amidst this complex migratory situation, Ecuadorian President Rafael Correa has endeavoured to pursue an extremely liberal free-movement policy, which one writer characterizes as one of the “world’s boldest contemporary efforts to reinvent human migration.”5 In 2008, the country adopted a new Constitution that provides “universal citizenship” (ciudadania universal) and explicitly promotes the rights of migrants. In article 416(6) the Constitution advocates for “the principle of universal citizenship, the free movement of all inhabitants of the planet, and the progressive extinction of the status of alien or foreigner as an element to transform the unequal relations between countries, especially those between North and South.” Article 40 recognizes the right to migrate and provides that no one shall be considered illegal because of his or her migratory status. Grounds for detention. The Migration Act does not explicitly list grounds providing for immigration detention. 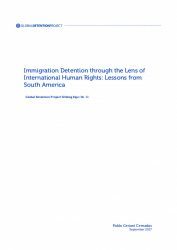 Rather, detention is linked to and triggered by deportation proceedings, which is similar to the detention framework in various other countries (including Egypt, Malta, and Morocco). The Migration Act provides that police officers of the Migration Service may arrest non-citizens if they appear to have violated any norms that can constitute grounds for deportation (Migration Act, article 20). The law provides four sets of grounds for deportation: 1) unauthorized entry; 2) subject to specific exclusion grounds (see below); 3) being convicted in Ecuador of a criminal offence; and 4) being a criminal suspect who cannot be tried in Ecuador for lack of territorial jurisdiction (Migration Act, article 19). Asylum seekers. Ecuador is one of the most important countries of refuge in the world, hosting tens of thousands of refugees from neighbouring Colombia. However, while the country’s Constitution frames global migration in human rights terms, it has recently implemented measures aimed at restricting who qualifies as a refugee, as noted earlier in this report. The Migration Act does not specifically prohibit or provide for the detention of asylum seekers. Article 15 states that Migration Service officers can provisionally admit foreigners applying for political asylum at ports of entry without subjecting them to exclusion grounds. The asylum seekers are to remain under surveillance at the port of entry until the Consular Department of the Ministry of External Relations resolves the case. Asylum Access Ecuador claims this provision in the Migration Act contradicts the non-penalisation clause provided in the 2012 Regulation on the Application of the Right to Asylum.19 Modelled upon article 31(1) of the 1951 Convention relating to the Status of Refugees, article 12 of the 2012 asylum regulation establishes that no administrative sanctions are to be imposed for irregular entry or stay of persons in need of international protection coming directly from territory where their life, liberty, integrity, or security are threatened and when they present themselves to authorities within 15 days upon the arrival. In cases where administrative proceedings related to irregular entry or stay of a person claiming refugee status have already started, these proceedings are to be suspended until final decision is adopted. If refugee status is denied, criminal and/or administrative proceedings resume; if the refugee status is granted, these proceedings stop (Regulation on the application of the right to asylum, article 13). Length of detention. As the Migration Act does not specifically provide grounds for detention it also does not set a maximum permissible length of detention. Non-citizens are apparently intended to remain in detention until deportation is carried out or the person is released. If a deportation order cannot be completed, a criminal judge is to replace detention with alternative measures, which are set out in the Code of Criminal Procedure (see below “Non-custodial measures”). Procedural guarantees. Because detention is intrinsically linked to deportation, detention-related procedural protections stem from the rules governing deportation proceedings. Most of the safeguards are provided in the Code of Criminal Procedure, which applies to immigration detention and deportation proceedings. Criminalisation. Article 37 of the Migration Act sets out penal sanctions for violations of its provisions, which are regulated by the Code of Criminal Procedure. Accordingly, the article lists several states-related infractions, which can be punishable with imprisonment and/or fine. Among the relevant infractions are entering or attempting to re-enter the country without authorization after having been deported, which can be punishable with imprisonment for up to three years and a fine of up to 4,000 USD. Jokisch, Brad D. “Ecuador: From Mass Emigration to Return Migration?” Migration Policy Institute. November 2014.www.migrationpolicy.org/article/ecuador-mass-emigration-return-migration. UN Department of Economic and Social Affairs (UNDESA). “International Migration 2013 Wall Chart.”http://www.un.org/en/development/desa/population/publications/migration/migration-wallchart-2013.shtml. Jokisch, Brad D. “Ecuador: From Mass Emigration to Return Migration?” Migration Policy Institute. November 2014.www.migrationpolicy.org/article/ecuador-mass-emigration-return-migration. U.S. Embassy in Costa Rica. Confidential Cable from U.S: Embassy in San Nose, Costa, Rica, to U.S. Secretary of States, dated 2008-11-12. Released by Wikileaks. https://www.wikileaks.org/cable/2008/11/08SANJOSE882.html. Benavides Llerena, Gina et al. Migraciones y Derechos Humanos en la Región Andina. Una mirada desde la Sociedad Civil: Informe Regional. Universidad Andina Simón Bolívar. June 2013. Ruesen Eva, Adriana Blanco and Karina Sarmiento (Asylum Access Ecuador). Global Detention Project Questionnaire: Ecuador. 15 October 2013. Arcentales Illescas, Javier. LAS POLÍTICAS DE DEPORTACIÓN EN EL ECUADOR: ANALISIS DESDE UN ENFOQUE DE DERECHOS HUMANOS. PROGRAMA ANDINO DE DERECHOS HUMANOS ESPECIALIZACIÓN SUPERIOR EN DERECHOS HUMANOS. 2012. Arcentales Illescas, Javier. LAS POLÍTICAS DE DEPORTACIÓN EN EL ECUADOR: ANALISIS DESDE UN ENFOQUE DE DERECHOS HUMANOS. PROGRAMA ANDINO DE DERECHOS HUMANOS ESPECIALIZACIÓN SUPERIOR EN DERECHOS HUMANOS. 2012. Ruesen Eva, Adriana Blanco and Karina Sarmiento (Asylum Access Ecuador). Global Detention Project Questionnaire: Ecuador. 15 October 2013. Undisclosed source. Email communication between members of civil society organizations and Izabella Majcher (Global Detention Project). May 2015. Blanco, Adriana (Asylum Access Ecuador). Additional Information to the Global Detention Project Questionnaire: Ecuador. 20 December 2013. Benavides Llerena, Gina. Procesos de deportación en Ecuador. Programa Andino de Derechos Humanos (PADH). 2008. Dirección Nacional del Mecanismo de Prevención de la Tortura, Tratos Crueles y Degradantes (MNPT). INFORME DE LA VISITA PORMENORIZADA AL CENTRO DE ACOGIDA TEMPORAL PARA CIUDADANOS/AS EXTRANEJROS/AS EN PROCESO DE DEPORTACIÓN “HOTEL CARRIÓN.” July 2014. Benavides Llerena, Gina. Procesos de deportación en Ecuador. Programa Andino de Derechos Humanos (PADH). 2008. Ruesen Eva, Adriana Blanco and Karina Sarmiento (Asylum Access Ecuador). Global Detention Project Questionnaire: Ecuador. 15 October 2013. Undisclosed source. Email communication between members of academia and Izabella Majcher (Global Detention Project). May 2015. Undisclosed source. Email communication between members of civil society organizations and Izabella Majcher (Global Detention Project). May 2015. Undisclosed source. Email communication between members of academia and Izabella Majcher (Global Detention Project). May 2015.
International Detention Coalition (IDC). INFORME REGIONAL DETENCIÓN MIGRATORIA Y ALTERNATIVAS A LA DETENCIÓN EN LAS AMÉRICAS. October 2014. Undisclosed source. Email communication between members of civil society organizations and Izabella Majcher (Global Detention Project). May 2015. Ministerio del Interior. Website. “Respeto a DDHH es prioridad en el Centro de Acogida para extranjeros en situación irregular.” 5 December 2013. www.ministeriointerior.gob.ec/respeto-a-ddhh-es-prioridad-en-el-centro-de-acogida-para-extranjeros-en-situacion-irregular/. Ruesen Eva, Adriana Blanco and Karina Sarmiento (Asylum Access Ecuador). Global Detention Project Questionnaire: Ecuador. 15 October 2013. Undisclosed source. Email communication between members of civil society organizations and Izabella Majcher (Global Detention Project). May 2015. Defensoria del Pueblo de Ecuador. Pronunciamento N. 003-DPE-DINAPROT-55277-2012. January 2012. Arcentales Illescas, Javier. 2012. LAS POLÍTICAS DE DEPORTACIÓN EN EL ECUADOR: ANALISIS DESDE UN ENFOQUE DE DERECHOS HUMANOS. PROGRAMA ANDINO DE DERECHOS HUMANOS ESPECIALIZACIÓN SUPERIOR EN DERECHOS HUMANOS. 2012. Code of Criminal Procedure. Article 164-166. Code of Criminal Procedure. Article 13. Code of Criminal Procedure. Article 172. Code of Criminal Procedure. Article 171. Ministerio del Interior. Respeto a DDHH es prioridad en el Centro de Acogida para extranjeros en situación irregular. 5 December 2013. Ministerio del Interior. Website. 2013b. “Respeto a DDHH es prioridad en el Centro de Acogida para extranjeros en situación irregular.” 5 December 2013. http://www.ministeriointerior.gob.ec/respeto-a-ddhh-es-prioridad-en-el-centro-de-acogida-para-extranjeros-en-situacion-irregular/ (accessed 2 April 2015).